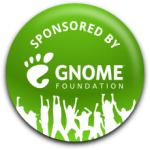 The GNOME Foundation was kind enough to sponsor myself and five other hackers from all over the world to head to Boston, MA for a weekend of coding, designing, and fun. We worked on Snowy, a really clever way to sync tomboy notes between different devices and computers. Brad Taylor was nice enough to let us use his sweet pad for our first day of the hackfest. My task was primarily to work on note sharing and a user interface for making private notes public. After a rough ui prototype was done, we all worked together on how to tackle note sharing on the backend. The original plan was changed to use a separate “Share” model instead of a special NoteTag for simplicity. K.I.S.S., it is a good thing. I’ve gotten all of the hard code written. The rest is mainly implementation details and cleaning up what is already there. The likely to be rebased and futzed with before being merged into master code is a hackfest/sharing branch on github. Hook up an onclick handler for the “Share this note with all users” entry for marking a note Public. Hook up an onclick handler for unsharing a note with one of your “friends”. $.post() will rock your socks! 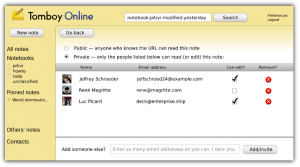 Send emails to users ala google docs when a user wants to share a note with you and types in your email. Paul, Owen Taylor, and myself also had an impromptu GNOME SysAdmin team meeting. The times, they’re a changin’. I’d like to give a special thank you to Paul Cutler and Sandy Armstrong for herding cats and making sure we stay on task. Without their tireless effort, things wouldn’t have went nearly as smooth as they did. This was a great hackfest overall and expect to see great things coming to Tomboy Online as a result. Categories: Open Source, Planet GNOME.